A whole big thing of grit. What we now know as the “Western” genre has grown exponentially over the years in both followers and pervasiveness, but what exactly is it that makes the Western so attractive? Older generations seem to come to it for the sense of freedom it bestows, the dark storylines, the chance to see rad dudes do rad things. For a few relative newcomers (such as myself), the genre takes on an extra layer of subqualities, going slightly beyond what is on screen and delving instead into what isn’t; it’s the implications. It’s a glimpse at a seemingly endless landscape, it’s a nod or smirk offering a morsel of a character’s past, it’s the deserted, crumbling town that serves as a camp site on an extended journey. Westerado: Double Barreled recognizes all of these facets and blends them seamlessly into a game far better than it has any right to be. Before we get too deep into the review, I should be clear about one thing. 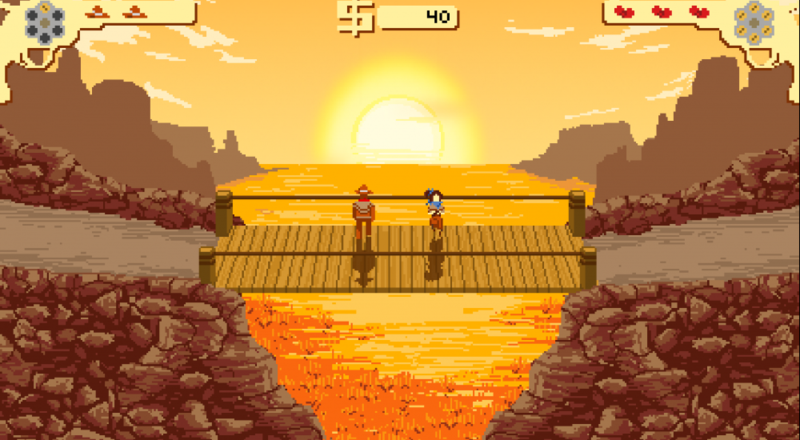 As the name and publisher (Adult Swim Games) imply, Westerado is not a serious game, nor is it especially deep. It should be approached not with an expectation of genre definition, but instead as something of a humorous love letter. It takes all the aforementioned ideas and boils them down to their essences, leaving behind an exceptionally fun, albeit brief romp. Oh, also the soundtrack is ten gallons of dope. 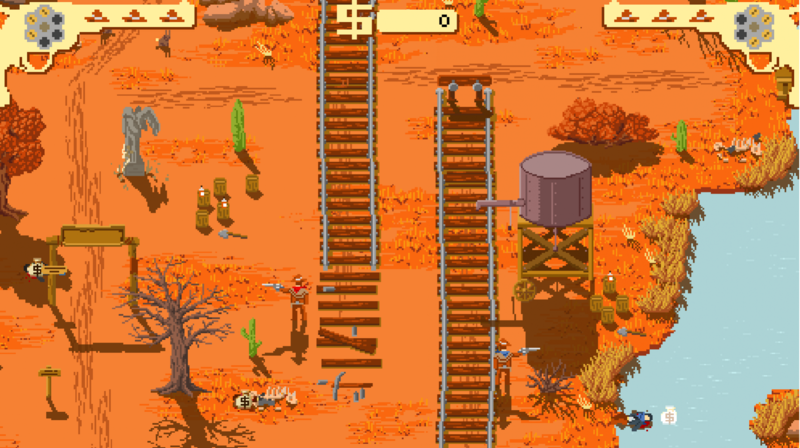 So, what exactly is Westerado? To put it succinctly, it’s a former flash game developed by Ostrich Banditos that, in the process of its revamp, gained a local co-op mode. Gameplay-wise, I’d call it a 2D open world shooter, though it contains a number of elements from other genres. You and your co-op partner play as a recently orphaned son and…a fella who looks strikingly similar to him. After his family is murdered at their ranch, the hero naturally sets off on a quest for revenge. The problem, of course, is that he doesn’t know exactly who did it. To track down this faceless killer (represented gracefully in the pause menu as a portrait with a cycling set of physical features), he embarks on a quest to assist any folks who might have an idea of the murderer’s identity. As a reward, they reveal a single physical feature (which then becomes static in the portrait). It’s a clever gamification of the revenge tale and allows for the murderer’s features to be randomized, making each playthrough slightly different. As I mentioned before, Westerado is an open world adventure. I know the comparison is probably well trodden, but consider it Red Dead Redemption-lite in this regard. However, where larger budget open world games still have a few restrictions to ensure the player doesn’t break the overarching story, Westerado does not. The player is given total freedom as to who they wish to help, ignore, or even shoot. A perfect example of this comes right out of the gate, when the hero awakes at his uncle’s cabin. Even while the uncle is providing some last remnants of the tutorial, the player can draw and (if they’re total jerks) fire away. Complete freedom of choice plays further into the prospect of multiple playthroughs, giving the game some much-needed longevity. Page created in 0.8560 seconds.